While still a fraction of print sales, digital comics continue to grow. (Digital comics being comic books you read on the web and mobile devices like the iPad and Android phones.) Great news, right? I’m a big believer in digital comics. But it’s not so easy to know exactly how much they’re growing or whether everyone’s just really excited about a lot of unsubstantiated press release hype. Within a week of each other, the largest comic book publishers in North America both claimed that sales of one of their digital comics surpassed their own records for digital sales. In both instances, the record-setting digital comic was released on the same day as its print counterpart was released in comic book stores. DC Comics announced in this interview with Salon the good sales news for Justice League #1 by Geoff Johns and Jim Lee, the launch title for their ambitious and highly publicized New 52 initiative. Jim Lee: [B]ased on recent numbers, certainly Justice League No. 1 has surpassed the recent highs in comics sales. […] It’s also setting records digitally. I can’t give numbers, but on the first day it set a record for us. Salon: Once you compared the volume of DC’s digital comics sales to dental floss. Is it up to dental tape now? Jim Lee: It’s too early to say. 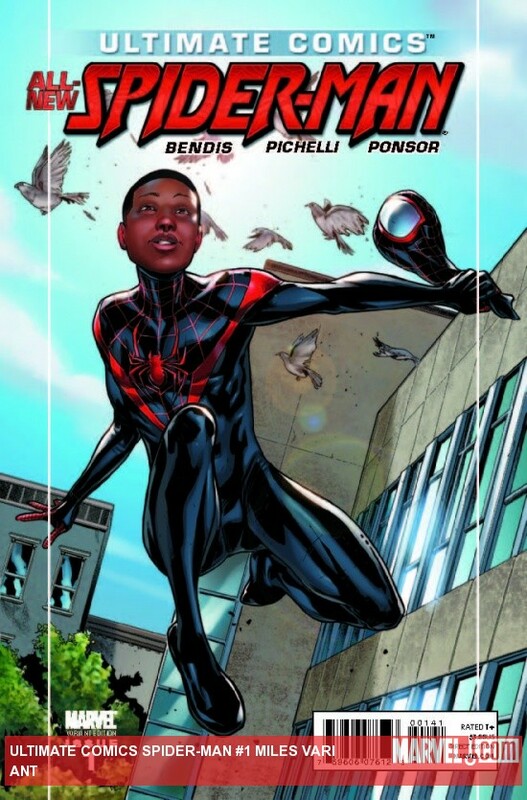 Marvel Comics later issued a press release for their announcement regarding Ultimate Comics Spider-Man #1 by Brian Michael Bendis and Sara Pichelli, where the webbed adventures begin for the half-black/half-Latino Miles Morales. The trick? Neither publisher actually revealed any concrete sales data. This has caused a bit of consternation among comics industry watchers, who are trying to understand the actual strength of digital comics and sales of comics in general. As The Comics Reporter‘s Tom Spurgeon wonderfully puts it, sales figures are usually only hinted at or used for hype by publishers like DC and Marvel, resulting in the “I have a girlfriend in Canada” of sales analysis. Looking outside of comics, most entertainment companies don’t share honest sales numbers because they consider that proprietary information, but those other industries have something comics doesn’t have – a third party tracking sales through reasonably objective means. Put bluntly, comics needs a Nielsen. The best we have are the sales estimates put together by ICv2, John Jackson Miller’s The Comics Chronicles, and a few others. These are best guess estimates based off charts provided by the largest distributor of comic books, Diamond Comics. But they’re only counting comic book stores in North America. There’s little to no coverage of book stores, no coverage of subscriptions, no sales to libraries and schools, nothing from the UK and other countries, no newsstand sales (meager but still out there), no sales from other outlets like grocery stores. To be sure, North American comic book stores are the dominant sales channel for print comic books. But it’s not the entire picture. What’s more, the sales estimates are determined by using Diamond’s odd index numbering system constructed around everything’s relative sales to that month’s issue of Batman. So if you figure out the sales of Batman in any given month, you can figure out the sales of everything else in that same month. Why Batman of all things? It’s mostly arbitrary but its sales have been historically pretty stable due to the character’s popularity and longevity of the series. On top of all that, the numbers only reflect what comic book stores are ordering. We have almost no idea about sell-through to actual paying customers beyond anecdotal reporting and the assumption that most stores are ordering month-to-month close to what they think they can sell. Needless to say, the accuracy of these estimates has been disputed and called into question. Some say it gives a fairly reasonable picture and is better than nothing, which is true. But numerous comic book creators have gone on record to say that the estimates are wrong when compared to their royalty vouchers and other internal accounting statements. So we’ve got an entire industry more or less groping in the dark trying to feel out the shape and size of their own business. But it’s the best we’ve got, so numbers are put under the microscope. At least there’s something for print comics. Digital comics have vague statements of modest to booming success. ICv2 estimated earlier this summer that digital comics sales are generating between $6 to $18 million a year, with sales doubling from 2009 to 2010. Archie Comics boasted nearly 2 million downloads back in January. ComiXology, the undisputed largest digital comics provider, trumpeted surpassing 1 million downloads at the end of 2010, and their main Comics app was recently the second grossing iPad app, outselling the popular app for the Angry Birds game. IDW Publishing announced over 1 million downloads of their various digital comics apps back in April. Plenty of similar announcements have been made. It’s great news because it confirms that there are a lot of people interested in comic books. But how many of those downloads generated money. It’s free to download almost all digital comics apps, and there are plenty of free comic books available to download within each app. How many of those millions are paying? What we do know is that digital comics is one of the biggest growth sectors for comics. The independent comics publisher SLG Publishing recently announced they were switching to digital first distribution. The transition will see the end of print comic books from the publisher. Issues will instead be released only as digital comic books that will eventually be collected and released for the first time in the physical world as print graphic novels. While several publishers have abandoned the single issue comic book format to strictly graphic novels, this is the first significant comics publisher to transition their serialized stories to the digital space. SLG was among the first publishers to embrace digital. They are one of the few that allow full ownership of their digital comics through their Eyemelt store, which sells .pdf, .ePub and .cbz that can be used anywhere. (ComiXology and other digital comics providers are technically leasing you the right to view images of comics files, which can be and have been taken away or locked.) SLG comics are also available on iBooks, Barnes & Noble’s Nook, ComiXology, iVerse’s Comics+, Graphicly, and Panelfly. According to SLG publisher Dan Vado, much of the company’s marketing has not been focused on digital, so their sales there have been promising but not exceptional. In fact, in a surprising break from the above trend, Vado was willing to make public some of the company’s digital comics sales figures. The best selling downloadable comic we have had is The Griffin #2 at around 200. This is like a 20 year old comic I did for DC Comics. Most of the other books have struggled to get to triple digits. How does that one digital comic stack up against the digital sales of Justice League #1 and Ultimate Comics Spider-Man #1? I’d like to believe there’s a significant difference but who can tell? For whatever it’s worth, Justice League #1 has 318 reviews on ComiXology, while Ultimate Comics Spider-Man #1 only has 58, at the time I’m writing this. Not everyone that buys and reads a digital comic will submit a review of whether it was a 5-star comic but that seems like a bare minimum at least. Except that anyone can leave a review whether they’ve read the comic or not, as long as they’ve logged in. As The Beat’s Heidi MacDonald points out in the above link, SLG’s most popular and well known property is probably Johnny the Homicidal Maniac by Jhonen Vasquez and that will be released digitally next year. Vado expects that to be their top digital seller very quickly, especially since they will have ramped up their marketing efforts focused on new readers instead of readers that already own the print version. If Vado continues to be as transparent, SLG could be a very interesting case study of a publisher transitioning to digital. And in the process, he could give us a better idea of the actual strength and success of digital.